The fourth largest city in the United States with a population of approximately 2.1 million people. 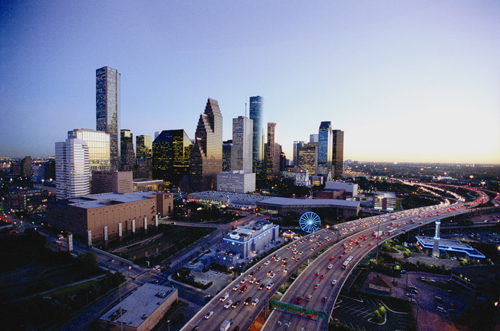 The population of the greater Houston metropolitan area is approximately 6 million people. Houston is located in eastern Texas, on Galveston Bay, near the Texas Gulf Coast. It is approximately two hours from the Texas/Louisiana border. It is unofficially nicknamed the "Bayou City" because of four bayous that run through the city. Houston's official nickname is "Space City" since it is home to NASA's Lyndon B. Johnson Space Center, where Mission Control is located. The port of Houston is one of the ten busiest ports in the world and one of the busiest ports in the United States. Houston is well known for its energy/oil and aeronautics industries and is home to the world-renowned Texas Medical Center. Long famous as a home for Tex-Mex cuisine, Houston offers the cuisine of almost every ethnic group. Excellent restaurants for every taste can be found in just about every part of the city. For individuals whose nighttime interests turn to the nightclub, dancing, and music scene, few places offer as much as Houston. In Houston, an individual can enjoy just about every type of music, including: blues, classical, choral, country, jazz, and Zydeco. While scattered throughout the city, a great deal of Houston�s nightlife is concentrated in the Downtown and Uptown sections of the city. If you're interested in Houston, please email your resum� with an introductory letter to to Dayna Lynn at dlynn@fsgltd.com or fill out the form below.